Seriously? OMG! WTF?James Van Der Beek Archives - Seriously? OMG! WTF? 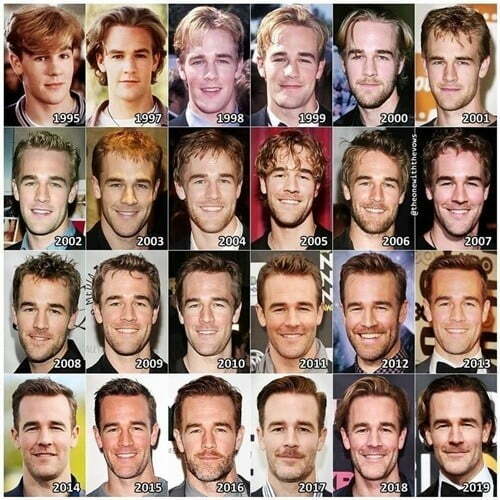 We have been watching James Van Der Beek grow up in front of our eyes since 1998 when he starred in Dawson’s Creek. While he has become more manly throughout the years, I did not realize how much he has aged in 25 years. That was until yesterday when he posted 24 side-by-side photos of himself since 1995. Yes, he has gotten older, so have we all. The 41-year-old has just aged better than us. Especially when you consider he is the father of 5 young children. If we had that many rugrats in our lives we would look like we were ready to move into Shady Pines. Not him, so what is his secret? James Van Der Beek is trying out a mustache, but you might want to second guess yourself before you ask him about it. Dawson shared a story about someone who did. On this one, I hate to say it, but I have to admit it, the shade is deserved. No one looks good with a mustache. Plus, if it is not a pornstache, why grow it? So Beek, is it for a role? James Der Van Deek spends Father’s Day as a father of five! Thrilled to announce we welcomed a brand new baby girl into the world Friday morning, just in time for #FathersDay  These last few days, as I’ve enjoyed the privilege of making smoothies I know my older kids will like, making my wife red raspberry leaf tea to ease her uterine contractions, spending “boy time” with my son and getting my two year-old down for a nap in the way only I know how… I’ve been heart sick about something. As I write this, kids are being ripped from the arms of their parents. By our government. For the kid’s benefit? No – the opposite – as a purposeful display of cruelty to deter would-be illegal border crossers AND legal asylum seekers (it’s happening to both). And it wouldn’t be honest to wax poetic about my new-baby bliss without speaking up against this atrocity. If we allow our government to de-humanize fathers, and mothers, and children in the name of defending our borders… we’ve lost a huge part what makes those borders worth defending. And even if you don’t believe in karma, or in extending basic human decency to people who didn’t win the geographic birth lottery… even if you’re hard-liner enough to say, “Break the law, suffer the consequences,” shouldn’t the punishment at least fit the crime? And if you’re still cold enough to say, “Well, it’s effective,” consider this: This heinous practice was put into place by our own attorney general (who justified it with a cherry-picked Bible verse), and our president blamed rivals before tweeting his list of legislative demands to be met before he stops it. Regardless of how you feel about immigration, or a wall, or this president… if we say we’re okay with our government using human rights violations as a deterrent or as a bargaining chip… what happens when we find ourselves on the wrong side of the agenda? Either in this administration or the next? This should not be a political issue – it’s a human one. A crime against humanity is a crime against us all. More info in link in my bio. Oh, and @vanderkimberly – you’re a f*cking earth goddess rock star and I’m as in awe of you as I am in love with you. And our new baby’s name is Gwendolyn ❤️ #HappyFathersDay everybody. James Van Der Beek’s Father’s Day Present came two days early when his wife Kimberly gave birth to their fifth child. Gwendolyn joins Olivia, 7, Joshua, 6, Annabel, 4, and Emilia, 2. Hopefully, for Joshua, baby #6 will be a boy. You know they are going to have a sixth one. Thankfully, he has been working nonstop because that is the only way he can afford to feed all of those mouths! Is James Van Der Beek trying to say raising kids is like pulling teeth? James Van Der Beek went to the dentist yesterday and he took his son with him. Like most 5-year-olds, Joshua was curious to see what was going on. The dentist gave him a chair and let him observe his father’s suffering. Something it looks like he enjoyed! Maybe someday he will become a dentist, and help support his parents. After all, he has at least 4 siblings that will be spending all of his parents’ money and they will need it. James Van Der Beek’s party of 5! James Van Der Beek and his wife, Kimberly, are expecting their 5th child together later this year. The proud pop broke the news on Twitter with his four children, Olivia, 7, Joshua, 5, Annabel, 4, and Emilia, exactly 23 months, touching their mom’s belly. Hopefully, it is another boy because Dawson and Joshua need some more testosterone in that household. Congrats and remember five is alive! Now when are you going to have number 6?